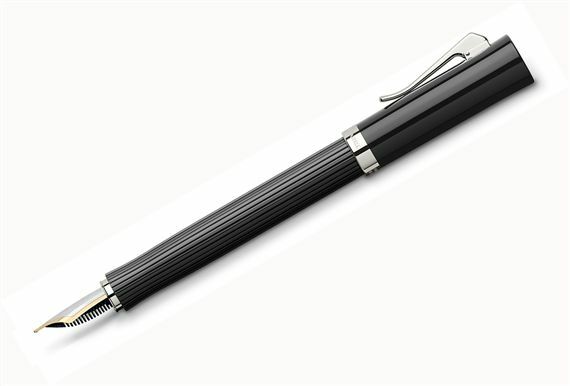 Order your Graf Von Faber-Castell Intuition Platino Lines Fountain Pen today from FahrneysPens.com. Fine Pens, Refills & Luxurious Gifts – great prices & fast shipping. Graf von Faber-Castell expands its Intuition Lines series with the new, larger Platino! The large finely-chased 'Lines' barrel is elegantly formed in a single piece, with a gently curved depression to sit comfortably in the hand. Gleaming platinum-plated accents include the rings engraved with the words "handmade in Germany" and the Graf von Faber-Castell medallion in the crown. The fountain pen holds Faber’s finest handmade, hand-tested, bi-color 18K gold nib. The rollerball has an amazingly long-lasting Magnum refill. The fountain pen and capped rollerball are loaded via the front section for seamless filling. A front-loading ball pen and 0.7mm pencil with eraser complete the collection. The Intuition Platino’s fluted shape and spring-loaded clip are familiar features to fans of the German-made quality of Graf von Faber-Castell.